Al-Mustarshid Billah (Arabic: المسترشد بالله)‎ (1092 – 29 August 1135) was the Abbasid Caliph in Baghdad from 1118 to 1135. He was son of his predecessor, Caliph Al-Mustazhir. Al-Mustarshid achieved more independence as a ruler while the Seljuq Sultan Mahmud II was engaged in war in the East. In 1122, al-Mustarshid deposed and imprisoned his vizier Amid al-dawla Jalal al-Din Hasan ibn Ali. Mahmud II then imposed Ahmad ibn Nizam al-Mulk as his vizier. In 1123 an Arab Banu Mazyad general, Dubais, tried to take advantage of the momentary lack of power and, after plundering Bosra, attacked Baghdad together with a young brother of the sultan. He was however crushed by a Seljuq army under Zengi and Ahmad ibn Nizam al-Mulk. During the same year, al-Mustarshid removed Ahmad ibn Nizam al-Mulk as his vizier. In 1125 it was the time of al-Mustarshid to rebel. He sent an army to take Wasit but was defeated near Baghdad and imprisoned in his palace (1126). 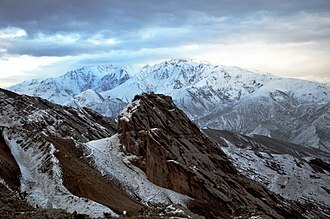 At the death of Sultan Mahmud, a civil war broke out in the Seljuq western territories. Zengi was recalled to the east by certain rebel members, stimulated by the caliph and Dubais. Zengi was beaten and fled. The caliph pursued him to Mosul, and besieged him there but without success for three months. It was nonetheless a milestone in the revival of the military power of the caliphate. 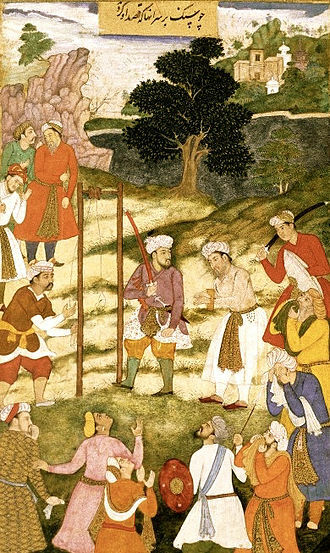 Zengi now resumed operations in Syria and in 1134 laid siege to Damascus, but was induced, partly by the bravery of the enemy, partly at the instance of the caliph, to whom Zengi had made some concession in the public prayers, to relinquish the attempt. 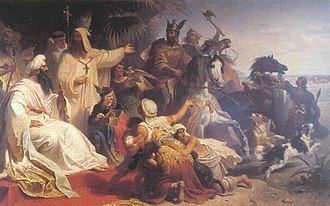 Recalled again by troubles in the east, he was unable to do much against the Crusaders till after al-Mustarshid's death. Not long after the siege of Damascus, al-Mustarshid launched a military campaign against Sultan Mas'ud of Western Seljuq, who had obtained the title in Baghdad in January 1133 by the caliph himself. The rival armies met near Hamadan: the caliph, deserted by his troops, was taken prisoner, and pardoned on promising not to quit his palace any more. Left in the caliphal tent, however, in the sultan's absence, he was found murdered while reading the Quran, as is supposed, by an emissary of the Hashshashins, who had no love for the caliph. Modern historians have suspected that Mas'ud instigated the murder although the two most important historians of the period Ibn al-Athir and Ibn al-Jawzi did not speculate on this matter. 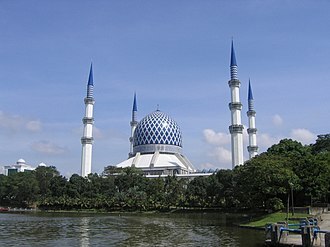 Physically, Al-Mustarshid was a red-haired man with blue eyes and freckles. He was succeeded by his son Al-Rashid. ^ Amin Maalouf (15 July 2012). The Crusades Through Arab Eyes. Saqi. 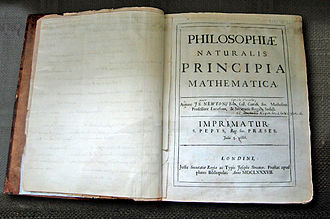 p. 81. ISBN 978-0-86356-848-0. This text is partly adapted from William Muir's public domain, The Caliphate: Its Rise, Decline, and Fall. Hanne, Eric. Putting the Caliph in his Place. Abū Muḥammad ʿAlī ibn Aḥmad, better known by his regnal name al-Muktafī bi-llāh, was the Abbasid Caliph in Baghdad from 902 to 908. His reign saw the defeat of the Qarmatians of the Syrian Desert, and the reincorporation of Egypt, the war with the Byzantine Empire continued with alternating success, although the Arabs scored a major victory in the Sack of Thessalonica in 904. His death in 908 opened the way for the installation of a ruler, al-Muqtadir, by the palace bureaucracy. Ali ibn Ahmad was born in 877/8, the son of Ahmad ibn Talha, real power, lay with al-Mutamids brother, al-Muwaffaq, Alis paternal grandfather. Al-Muwaffaq enjoyed the loyalty of the military, and by 877 had established himself as the de facto ruler of the state, most of the Arabian peninsula was likewise lost to local potentates, while in Tabaristan a radical Zaydi Shia dynasty took power. In Iraq, the rebellion of the Zanj slaves threatened Baghdad itself, following his rise to the throne, al-Mutadid continued his fathers policies, and restored caliphal authority in the Jazira, northern Syria, and parts of western Iran. Nevertheless, al-Mutadid managed to accumulate a considerable surplus in his ten-year reign, at the same time the bureaucracy grew in power, it saw a growth in factionalism, with two rival clans emerging, the Banul-Furat and the Banul-Jarrah. 894/5, and in 899 over the Jazira and the frontier areas, the future al-Muktafi took up residence at Raqqa. When al-Mutadid died on 5 April 892, al-Muktafi succeeded him unopposed, the new caliph was 25 years old. The historian al-Tabari, who lived during his reign, describes him as of medium size, handsome, of a delicate complexion, with beautiful hair, on the other hand, he was not as steadfast as his father, and was easily swayed by the officials at court. The early period of his caliphate was dominated by the vizier al-Qasim ibn Ubayd Allah, a very able man, he was ambitious, he had plotted to assassinate al-Mutadid shortly before the latters death, and now ruthlessly eliminated any rivals for influence over the new caliph. Shortly after, the managed to discredit al-Mutadids loyal commander-in-chief. Badr was forced to flee Baghdad but surrendered after being promised a pardon by the viziers agents, in the bureaucratic struggles of the period, al-Qasim ibn Ubayd Allah favoured the Banul-Jarrah and resisted the pro-Shiite leanings of the Banul-Furat. The leading representative of the Banul-Furat, Abul-Hasan Ali ibn al-Furat, al-Muktafis brief reign was dominated by warfare, but he was unlike his father, the ghazī caliph par excellence. Al-Mutadid had actively participated in campaigns, setting an example and allowing for the formation of ties of loyalty, reinforced by patronage. During the 9th century, however, a range of new movements emerged on the basis of Shiite doctrines and their missionary efforts soon spread, in 899, the Qarmatians seized Bahrayn, while another base was established in the area around Palmyra. 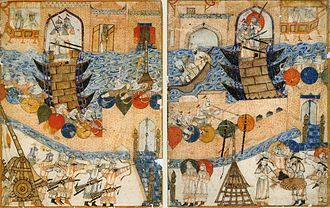 From there the Qarmatians began launching raids against the Abbasid and Tulunid provinces of Syria, in 902, the Qarmatians defeated the increasingly feeble Tulunids and laid siege to Damascus. Abu Abdallah Muhammad ibn Abdallah al-Mansur, better known by his regnal name al-Mahdi, was the third Abbasid Caliph who reigned from 775 to his death in 785. Al-Mahdi was born in 744 or 745 AD in the village of Hamimah and his mother was called Arwi, and his father was al-Mansur. When al-Mahdi was ten years old, his became the second Abbasid Caliph. When al-Mahdi was young, his father, the Caliph al-Mansur, so, on the east bank of the Tigris, al-Mansur oversaw the construction of East Baghdad, with a mosque and royal palace at its heart. Construction in the area was heavily financed by the Barmakids. When was 15-years-old, a-Mahdi was sent to defeat the uprising of Abdur Rahman bin Abdul Jabbar Azdi in Greater Khorasan and he defeated the uprisings of Ispahbud, the governor of Tabaristan, and Astazsis, massacring more than 70,000 of his followers in Khorasan. These campaigns put Tabaristan, which was nominally within the caliphate. 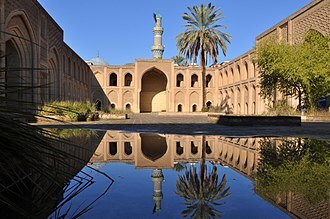 In 762 AD, al-Mahdi was the governor of the Abbasid Caliphates eastern region and it was here that he fell in love with al-Khayzuran and had several children, including the fourth and fifth future Caliphs, al-Hadi and Harun al-Rashid. Around 770 AD, al-Mahdi was appointed as Amir al-hajj, al-Mahdis father, Al-Mansur, died on the hajj to Mecca in 775. The throne passed to Al-Mansurs chosen successor, his son Al-Mahdi, according to Marozzi, was, by the standards of the future, blood-soaked successions of the Abbasid caliphate, a model of order and decorum. Al-Mahdi, whose nickname means Rightly-guided or Redeemer, was proclaimed caliph when his father was on his deathbed and his peaceful reign continued the policies of his predecessors. Rapprochement with the Alids in the Caliphate occurred under al-Mahdis reign and he imprisoned his most trusted vizier Yaqub ibn Dawud. In the year 167 AH/783 AD, al-Mahdi instituted an official inquisition which led to the execution of alleged Zindiq, in 775, a Byzantine envoy, travelled to Baghdad to convey the congratulations of the Byzantine emperor to Al-Mahdi on his accession to the throne. On completion, the envoys forecast proved to be correct, and so, delighted, Al-Mahdi ordered that all profits should be given to the envoy and it is believed this continued to his death, in 780. Abu’l-ʿAbbās Aḥmad ibn Jaʿfar, better known by his regnal name al-Muʿtamid ʿAlā ’llāh, was the Abbasid Caliph in Baghdad from 870 to 892. His reign marks the end of the Anarchy at Samarra and the start of the Abbasid restoration, power was held by his brother al-Muwaffaq, who held the loyalty of the military. Al-Mutamids authority was circumscribed further after an attempt to flee to the domains controlled by Ahmad ibn Tulun in late 882. In 881, when al-Muwaffaq died, loyalists attempted to power to the Caliph, but were quickly overcome by al-Muwaffaqs son al-Mutadid. 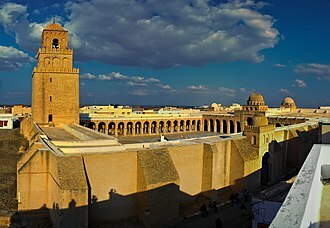 When al-Mutamid died in 892, al-Mutadid succeeded him as caliph, the future al-Mutamid was a son of Caliph al-Mutawakkil and a Kufan slave girl called Fityan. His full name was Ahmad ibn Abi Jaʿfar, and was known by the patronymic Abul-Abbas. On 21 June, al-Muhtadi was executed, the accession of al-Mutamid brought an end to the turmoils of the Anarchy at Samarra, which had begun with the murder of al-Mutawakkil in 861. Most of the Arabian peninsula was likewise lost to local potentates, even in Iraq, a rebellion of the Zanj slaves had begun and soon threatened Baghdad itself, while further south the Qarmatians were a nascent threat. When Caliph al-Mutazz died in 869, there was popular agitation in Baghdad in favour of his elevation to Caliph. In contrast to his brother, al-Mutamid appears to have lacked any experience of, at the time al-Muhtadi was killed by the Turks, Abu Ahmad was at Mecca. Immediately he hastened north to Samarra, where he and Musa ibn Bugha effectively sidelined al-Mutamid, al-Mutamid was thus quickly reduced to a figurehead ruler, which remained the case for the remainder of his reign. Within a short time, Abu Ahmad was conferred an extensive governorate covering most of the still under caliphal authority, western Arabia, southern Iraq with Baghdad. To denote his authority, he assumed a name in the style of the caliphs. 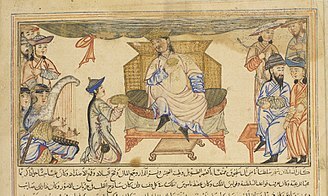 During his tenure, the Caliph retained some freedom of action, Ibn Wahb was soon disgraced and replaced as vizier by Ismail ibn Bulbul. Al-Muwaffaqs power was strengthened by the threats the Caliphate faced on all fronts. 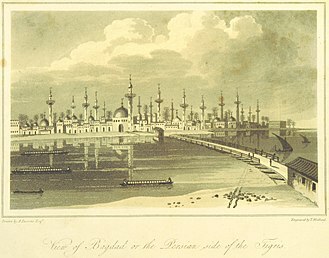 In April 876, al-Muwaffaq and Musa ibn Bugha defeated Yaqub ibn al-Layths attempt to capture Baghdad at the Battle of Dayr al-Aqul, the repulse of the Saffarids allowed the Abbasids to concentrate their resources in suppressing the Zanj Revolt in the south. He came to the throne at the age of 13, the youngest Caliph in Abbasid history, as a result of palace intrigues. His accession was soon challenged by the supporters of the older and more experienced Abdallah ibn al-Mutazz, al-Muqtadir enjoyed a longer rule than any of his predecessors, but was uninterested in government. Affairs were run by his officials, although the frequent change of viziers—fourteen changes of the head of government are recorded for his reign—hampered the effectiveness of the administration. The harem, where his mother, exercised total control, exercised a decisive influence on affairs. After a period of consolidation and recovery under his father al-Mutadid and older half-brother al-Muktafi, the full treasury inherited by al-Muqtadir was quickly emptied, and financial difficulties would become a persistent feature of the caliphal government. Ifriqiya fell to the Fatimids, although the commander-in-chief Munis al-Muzaffar was able to repel their attempts to conquer Egypt as well. Nearer to Iraq, the Hamdanids became autonomous masters of the Jazira, the forces of the Byzantine Empire, under John Kourkouas, began a sustained offensive into the borderlands of the Thughur and Armenia. As a result, in February 929 a palace revolt briefly replaced al-Muqtadir with his brother al-Qahir, the new regime failed to consolidate itself and after a few days al-Muqtadir was restored. The commander-in-chief, Munis al-Muzaffar, was by a virtual dictator, urged by his enemies, al-Muqtadir attempted to get rid of him in 932, but Munis marched with his troops on Baghdad, and in the ensuing battle on 31 October 932 al-Muqtadir was killed. The future al-Muqtadir was born on 14 November 895, as the son of Caliph al-Mutadid. His mother was the Greek slave concubine Shaghab, al-Mutadid was the son of al-Muwaffaq, an Abbasid prince who became the Caliphates main military commander, and de facto regent, during the rule of his brother, al-Mutamid. Al-Muwaffaqs power relied on his ties with the ghilmān, the foreign-born slave-soldiers that now provided the professional mainstay of the Abbasid army. According to the Syria Central Bureau of Statistics, Bosra had a population of 19,683 in the 2004 census. It is the center of the nahiyah of Bosra which consisted of nine localities with a collective population of 33,839 in 2004. Bosras inhabitants are predominantly Sunni Muslims, although the town has a small Shia Muslim community and it continued to be administratively important during the Islamic era, but became gradually less prominent during the Ottoman era. It became a Latin Catholic titular see and the see of a Melkite Catholic Archeparchy. 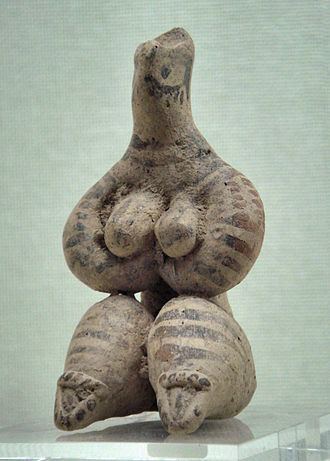 Today, it is a archaeological site and has been declared by UNESCO as a World Heritage Site. The settlement was first mentioned in the documents of Thutmose III, Bosra was the first Nabatean city in the 2nd century BC. The Nabatean Kingdom was conquered by Cornelius Palma, a general of Trajan, under the Roman Empire, Bosra was renamed Nova Trajana Bostra and was the residence of the legio III Cyrenaica. It was made capital of the Roman province of Arabia Petraea, the city flourished and became a major metropolis at the juncture of several trade routes, namely the Via Traiana Nova, a Roman road that connected Damascus to the Red Sea. It became an important center for production and during the reign of Emperor Phillip the Arab. The two Councils of Arabia were held at Bosra in 246 and 247 AD, by the Byzantine period which began in the 5th-century, Christianity became the dominant religion in Bosra. The city became a Metropolitan archbishops seat and a cathedral was built in the 6th-century. 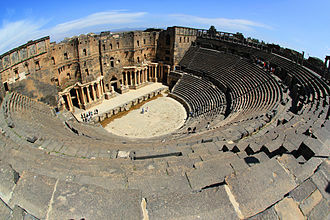 Bosra was conquered by the Sassanid Persians in the early 7th-century, Bosra played an important part in the early life of prophet Muhammad, as described in the entry for the Christian monk Bahira. The forces of the Rashidun Caliphate under general Khalid ibn Walid captured the city from the Byzantines in the Battle of Bosra in 634, throughout Islamic rule, Bosra would serve as the southernmost outpost of Damascus, its prosperity being mostly contingent on the political importance of that city. Bosra held additional significance as a center of the pilgrim caravan between Damascus and the Muslim holy cities of Mecca and Medina, the destinations of the hajj pilgrimage. Sir William Muir, KCSI was a Scottish Orientalist, scholar of Islam, and colonial administrator. He was born at Glasgow and educated at Kilmarnock Academy, at Glasgow and Edinburgh Universities, in 1837 he entered the Bengal civil service. Muir served as secretary to the governor of the North-West Provinces, and as a member of the Agra revenue board, in 1865 he was made foreign secretary to the Indian Government. In 1867 Muir was knighted, and in 1868 he became lieutenant-governor of the North Western Provinces, having been criticised for the poor relief effort during the Orissa famine of 1866, the British began to discuss famine policy, and in 1868 Muir issued an order stating that. In 1874 Muir was appointed member of the Viceroys Council, and retired in 1876. James Thomason served as Muirs mentor with respect to Imperial administration, Muir had always taken an interest in educational matters, and it was chiefly through his exertions that the central college at Allahabad, known as Muir Central College, was built and endowed. Muir College became a part of the Allahabad University, in 1884 Muir was elected president of the Royal Asiatic Society. In 1885 he was elected principal of Edinburgh University in succession to Sir Alexander Grant, and held the post till 1903, Muir was married to Elizabeth Huntly Wemyss. He died in Edinburgh, and is buried in Dean Cemetery, Sir William Muir was an Orientalist and scholar of Islam. His chief area of expertise was the history of the time of Muhammad, in 1888 he delivered the Rede lecture at Cambridge on The Early Caliphate and Rise of Islam. Written objections to this aspect of Life could be found in the writings of Muslims living inside the Empire only after the 1857 rebellion, however, a contemporary review in The Times criticized Life for propagandist writing with Christian bias and for odium theologicum. He thus combined scholarly and evangelical or missionary purposes,2, It is incumbent upon us to consider this question from a Christian point of view, and to ask whether the supernatural influence, which. Conquest of Baghdad by the Mongols in 1258 CE. 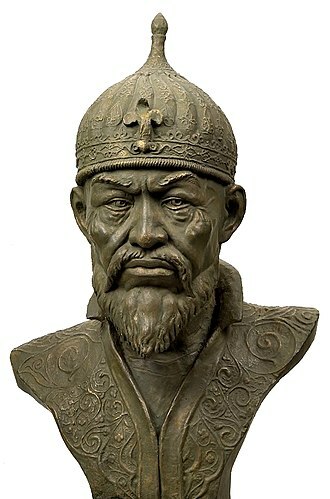 Central Asian Turko-Mongol conqueror Timur sacked the city and spared almost no one. Artistic rendering of Hassan-i Sabbah. 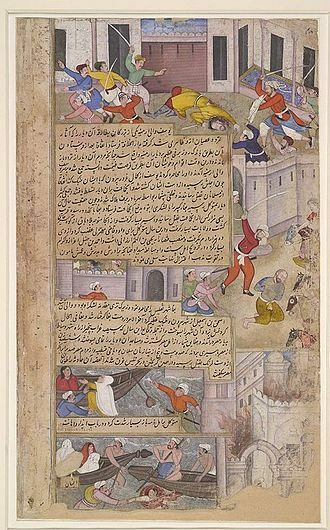 14th-century painting of the successful assassination of Nizam al-Mulk, vizier of the Seljuq Empire, by an Assassin. It is often considered their most significant assassination. A silver dirham minted in Madinat al-Salam (Bagdad) in 170 AH (786 CE). 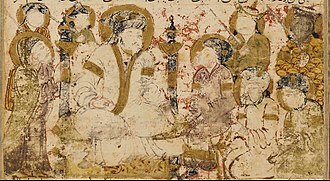 At the reverse, the inner marginal inscription says: "By order of the slave of God, Harun, Commander of the Faithful"
Harun al-Rashid receiving a delegation sent by Charlemagne at his court in Baghdad. 1864 painting by Julius Köckert. Harun al-Rashid as depicted in the Arabian Nights. 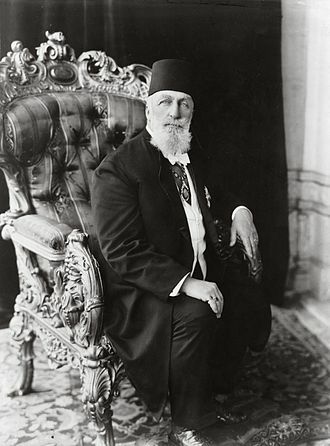 Ahmad Sanjar seated on his throne. Ahmad Sanjar, as featured on the front of the 5 Turkmenistan manat banknote. Dirham of Al-Mahdi, 166 AH, Kirman, silver 2.95 g.
The execution of Mansur al-Hallaj at the behest of al-Muqtadir on 26 March 922, as represented in a 17th-century Mughal Indian painting.